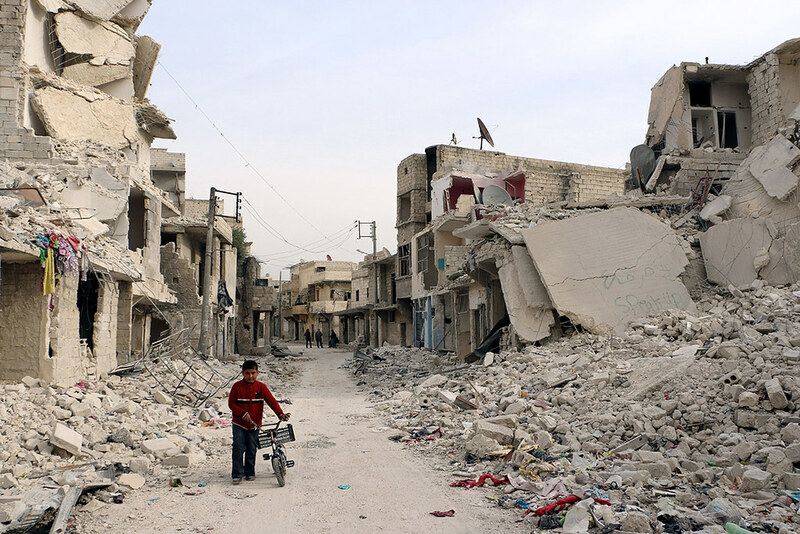 Home › Iranian Nuclear Crisis › Iranian Financial Sanctions › The Carnage in Aleppo – Deliberate Concealment of Iran’s Major Role in the Massacre? The collapse of the rebel forces in Aleppo came at a very heavy price. Anyone exposed to the visuals of Aleppo “before and after” (see also gulfnews) witnessed the wide spread devastation and atrocity. Foxnews, in an article titled “Iran playing major role in Aleppo carnage”, highlighted the fact that the outrage over the carnage in Aleppo has for some mysterious reason been directed mainly at Moscow and Damascus, suspiciously overlooking Iran’s major part in this bloodbath. The disregard of Iran’s role led the NCRI to produce a video dedicated to Iran’s major role in the massacre. Iran’s central role in the carnage was crystal clear in actions (Soleimani’s visits, establishment of secret camps training mercenaries, deploying Hezbollah combatants, foreign mercenaries and Shiite fighters widely, IRGC control of the city of Aleppo) and in self admittance. Iran boasted its involvement. In contradiction to their deceitful claims that their role in Syria is just “advisory”, when it came to the military victories, Iran was sure to acclaim the victory as theirs and gloat in this victory. As reported in yahoo world news, Yahya Safavi, top foreign policy advisor to the supreme leader Khamenei, was quoted stating: “The liberation of Aleppo… reinforces the political strength of Islamic Republic of Iran. The new American president must accept the reality that Iran is the leading power in the region”. As reported in sky news, President Assad himself associated the outcome to Iran and Russia: “taking back opposition-held areas of Aleppo after four years was as much a victory for Russia and Iran as his own country”. Some media outlets were frank about the Iranian involvement, debating also the implications. Reuters, for example, in an article titled “Aghast at Iran’s Syria Gains”, warned of a “dangerous tilt in the Middle East balance of power toward Tehran”. Gulf states and Saudi officials expressed extreme frustration. Given Iran’s deep involvement in this slaughter, and the concealment thereof by some reports, a few courageous analysts speculated on the phenomena. The weeklystandard speculated that there is a “deliberate avoidance of confrontation with Iran”, stating “the Obama administration is facing renewed criticism that it is avoiding confronting Iran over a widening list of the Islamic Republic’s sanctions violations and military activities”. A veteran defense department official, Matthew Mclnnis, is quoted there explaining and thereby admitting “we’re too afraid of losing the nuclear deal to push back against the actions of Soleimani and his subordinate proxies and terrorist groups”. The freebeacon discusses a deliberate downplaying, by the Pentagon, working on “politicized intelligence”, of threatening Iranian military acquisitions. Quoting sources they add “everyone knows the intelligence is politicized to hide the damage done by the President’s diplomacy”. It would seem that the letter to the editor by Frank Silnicky, from Bethesda, in the washingtonpost, reveals the dark truth, when he talks about “sacrificing Syria for the deal with Iran”. ‹ Iranian Nuclear Ships – Bluff or Threat?